I am a great believer in infographics as a way of explaining and improving the understanding of our impact on the planet and also where our greatest opportunities for change lie. Inspired by a book called Visual Leadership I have decided to give infographics a go for myself. 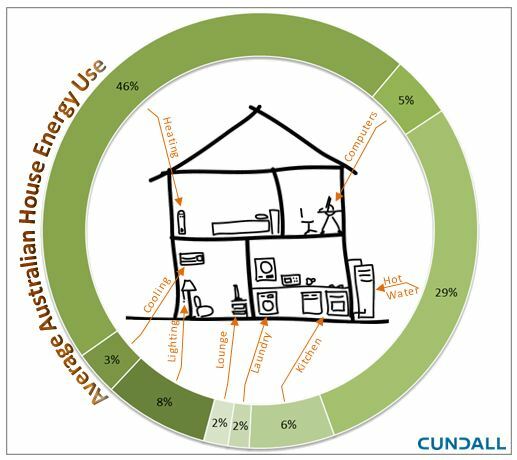 So here is my first foray into the world of infographics – “Average Australian House Energy Use”. All done with a laptop and iPad. When you look at the percentage of energy that goes into energy use within the average household you can certainly see why there is a great focus on improving the energy efficiency of the houses that we build. But we do need to better understand the impact of the policies and the implementation of these policies to make sure we are not adding to the cooling energy use whilst reducing the heating use. What was a surprise was how much energy was used by some of the appliances in the laundry and kitchen. There is a lot of focus on energy efficient driers and washing machines, but our kettles and microwaves as much energy every year as a drier and a washer does! Now remember this is the total energy used across all Australian households and so the results maybe skewed by how many dwellings have driers versus how many have kettles – it does however get you thinking about the smaller appliances that we buy and maybe how often we use them. Final food for thought (excuse the pun) is that we use six times more energy in ovens and cooktops than we do drying our clothes with a clothes drier.